If you’re a Netflix user, you know the struggle of finding a good movie to watch. The service is flooded with hundreds of Netflix originals and other uninspiring films that aren’t worth your time. With only a short blurb and thumbnail to grab your attention, it can be tough to filter the good from the bad. I can recall many times in which I searched for the right film for too long, only to give up and end up reluctantly watching an episode of “The Office” or “Parks and Recreation” again. In this new series, every couple weeks, I will explore the movies available on Netflix with interesting synopses — things that would interest a viewer — and offer a more accurate depiction of the films. I’ll tell you what to watch and what to avoid so that you don’t have to waste your time or end up watching the same old show. “Hush,” a 2016 thriller directed by Mike Flanagan, has a simple yet engaging plot. The summary, which reads, “A deaf writer who retreated into the woods to live a solitary life must fight for her life in silence when a masked killer appears in her window,” was convincing enough to draw me in. The movie introduces us to a deaf author named Maddie (Kate Siegel) who lives in isolation, with only a cat to keep her company. A violent masked intruder (John Gallagher Jr.) stumbles upon Maddie’s home after chasing down and slaying her neighbor. The killer quickly realizes that Maddie cannot hear and takes advantage of that fact. The film follows a cat-and-mouse chase in and around the house, mixing fast action scenes and slow, suspenseful ones. I particularly enjoyed how the audio would fade in and out occasionally, giving viewers a more accurate depiction of what Maddie experiences. Additionally, I appreciate that the story felt like something that could actually happen, in contrast to paranormal films. This makes the film more thrilling. Because the film is relatively short, at 80 minutes, and is engaging throughout, there was not a dull moment in the movie. I would highly suggest this film to someone who wants a quick thriller they haven’t seen before. The overview for “The After Party” mentions an upcoming rapper going viral for all the wrong reasons and a wild New York City after party, so I figured I’d give it a shot. I wish I hadn’t. 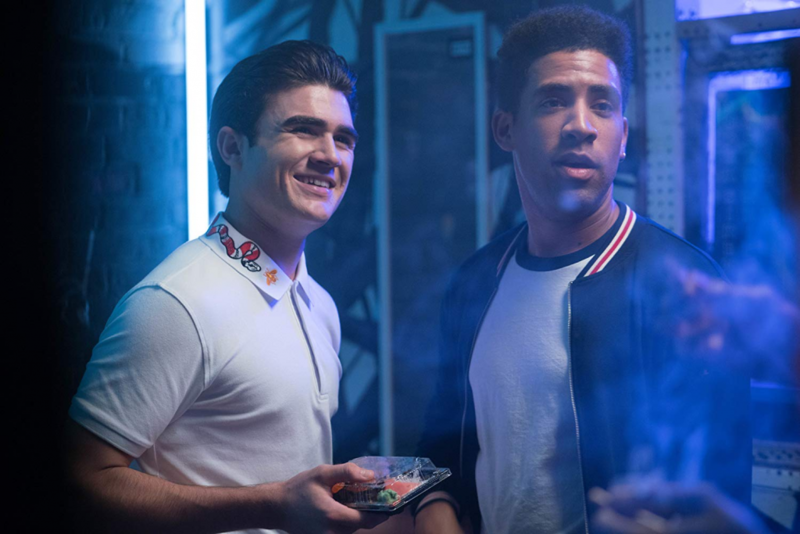 The movie features Owen (Kyle Harvey), a senior in high school and wannabe rapper who goes by the name “Oh!,” and his friend and manager Jeff (Harrison Holzer). Harvey, who is better known by his first name, Kyle, is a rapper who burst onto the scene after his hit collaboration “iSpy,” featuring Lil Yachty. After an embarrassing video of Owen surfaces on the internet, he decides that his rap dreams are over. He decides to enlist in the Marine Corps that Friday, but Jeff promises to secure him a record deal by then. Most of the story depicts Jeff struggling to get Owen to meet with the president of a large record label, because Owen is more interested in hooking up with Jeff’s sister. I couldn’t immerse myself in Owen’s dream because he didn’t show interest in it himself. The movie lacks a true plot and relies more on its guest stars and corny jokes that were so forced at times that they were cringeworthy. However, I did enjoy some parts of the movie. It featured high-profile hip-hop figures such as Wiz Khalifa, French Montana, Desiigner, DMX and Ski Mask the Slump God, among others. I also enjoyed the scenes in which Owen rapped and wished there had been more. The idea behind the movie was a good one, but in execution, it left much to be desired.